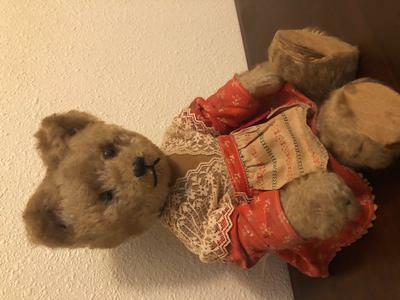 This bear is clearly from the 1950's post war. I can see it is a Schuco bear. The tag is still attached. It is red plastic and reads Schuco Tricky Patent Ang. and on the other side, it reads DB patent Ang. Int patents pending. Made in US zone Germany. So I know it was before 1953. This belonged to my aunt, and I suspect that my grandfather gave it to her when they were stationed as a family in Germany before he died in an unfortunate airplane accident. I see that this is a yes/no bear. The bear nods her head and also shakes her head. The mechanism works perfectly. Flat feet and down turned felt paws. Golden brown fur (maybe mohair) and golden and black eyes. Big ears. I see lots of bears on line fitting this description, but I have a few differences. This bear is wearing a peach (or maybe faded red?) dress with a v neck, long sleeves, beige floral and striped lace bodice and an attached cream colored apron with horizontal peach and green patterns It snaps closed in the back. 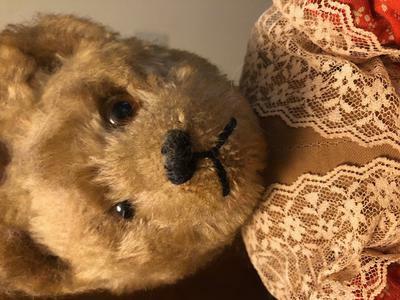 The bear is also wearing a cream colored diaper which looks original, It is trimmed with scallopped ric rak, and the tail pokes through the back. The diaper is pinned on with relatively new looking safety pins, I'm assuming these were replacements at sometime. The odd thing that doesn't seem to match with any of the pictures I've seen anywhere is that the legs, arms and body seem to be a brown fabric, without any fur. Now I'm wondering if this is original, or if perhaps it was a repair. The furry feet and the hands are attached to the legs and the arms at the wrists and the ankles. .